6th & 7th February, 2013. Show begins at 6:00 pm. WRITTEN BY- FARRUKH DHONDY, DIRECTED BY - MUKUL AHMED, SET BY - KHADIJATUL KOBRA, LIGHTING DESIGN - MIRZA SHAKHESEP AND ATIKUR RAHMAN PRODUCTION MANAGER- M.M.N.SAKIB OMEE. ACTORS: MIRANDA- SHAMIMA AKTER MUKTA, MONA - SHAMIMA SHAWKET LOVELY, SHAMIM VISTI, SHAMIMA AKTER MUKTA. SHAILA - SHAMIMA SHAWKET LOVELY. PRODUCED BY MUKUL AND GHETTO TIGERS. THE WORLD PREMIERE OF THE TRILOGY WILL BE HELD AT THE COMILLA CULTURAL FESTIVAL ON 31 JANUARY, 2013.
page for program photos & artworks. 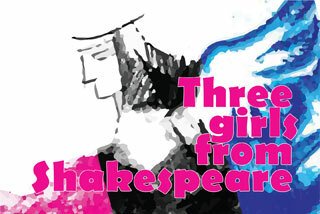 How would Shakespeare’s heroines have reacted if they were Bangladeshi young women of today? Shaila is a Bengali British woman, a financial expert in the employ of the government who is approached by Tony, a shipping magnate whose ships have been captured by Somali pirates to help him with a loan from her finance company. Shaila has her own personal problems, one of them being a life-threatening condition of a niece. She makes a deal with Tony involving an aristocratic wedding, a black-money-tax-evasion scam, a court case and an ending in which the audience finds out who is doing what to whom. Mona is a young woman who marries the black West Indian drug peddler whom her father, a rich property developer has hired as a security agent. Her mother and father disapprove of the connection and want her to be betrothed to a proper educated young man from a good Bengali family. Love is not a static condition. It is a dynamic affected by events and Mona’s emotions follow the trail of the events, cruelties and tragedies of the politics of the property mafia of Dhaka. Shakespeare’s Othello ends with the chief character killing his beloved out of jealousy. Does our modern Mona suffer the same fate? Miranda is a young out of work actress in Goa – until she gets picked up at a bar by a young white man who tells her that he from a troupe whose attempt to tour Shakespeare’s Tempest has been defeated by the death of their young heroine Miranda. On being told that she is an actress he asks her to take on the role and save their company’s tour. Miranda is auditioned and accepted and begins the rehearsals. She soon finds that the rehearsals are not what she expected as the actors and characters disappear day by day. A mysterious trip to the graveyard where the dead actress is buried is even more intriguing. A young black man whom she glimpses in the bars of Goa makes things plain while begging her to leave the rehearsals and go back to Mumbai. She is involved in something beyond her. The actors and the lover she has acquired are not what they seem. The theme of Shakespeare’s play haunts this production and raise questions of life, death and limbo.